The Floyd Mayweather-Conor McGregor is the ultimate triumph of flash over substance and misguided perception over reality. It makes no rational sense that an MMA fighter with no professional boxing experience should be slated to face a future Hall of Fame boxer in what is easily the biggest fight of the year. There’s no reason to expect a competitive bout. But this isn’t about competition. It’s about pure hype. Conor McGregor is unquestionably a great fighter. But he’s a great MMA fighter. And that success in the Octogon has nothing to do with why McGregor received this opportunity. McGregor got this fight because of his mouth. McGregor can sell a fight like nobody since Muhammad Ali. That was on full display this week during the two’s first press conference, in Toronto. It was the kind of media spectacle that should make professional wrestling green with envy. And in the age of the 24-hour sports cycle, with embedded video available with a simple click of the mouse, it pushed interest to a new high. I’m not excited about this fight or even happy about it. But I have to give credit where it’s do. The only good reason to be a professional prizefighter is so that you can make money. And McGregor is going to make himself and Mayweather a ton of money here. And since the promotional aspects of this bout are destined to be more interesting than the fight itself, we might as well score the individual press conferences. If we do, there is no alternative but to credit McGregor with a dominant, 10-8 round. Mayweather certainly had his moments. He is a decent trash talker for sure. He boasted about his status as a 100 million dollar man. He mocked McGregor for “quitting” or tapping out, as he did against Nate Diaz. 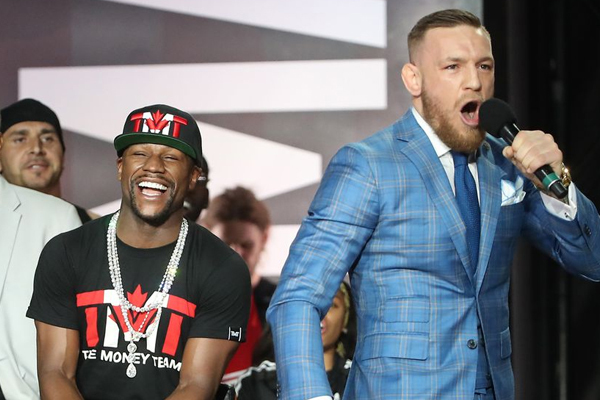 But Mayweather’s verbal skills were no match for McGregor’s. The rowdy Irishman was crudely boastful and humorously profane–all while dressed in an impeccably tailored pin-stripe suit. And everybody has been talking about him non-stop, ever since.